There’s a lot of fleas and ticks out there this time of year! 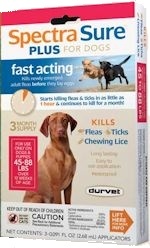 Protect your pets from fleas, ticks and lice and the diseases they can spread! This entry was posted on Friday, May 19th, 2017 at 3:00 pm	and is filed under News, Rainbow Wags Newsletter. You can follow any responses to this entry through the RSS 2.0 feed. Both comments and pings are currently closed.